Artist’s rendering of the AN/ALQ-249 Next Generation Jammer on the EA-18G Growler. Image via Raytheon. A memorandum of understanding (MoU) between Australia and the US has been signed for the development of the Next Generation Jammer. 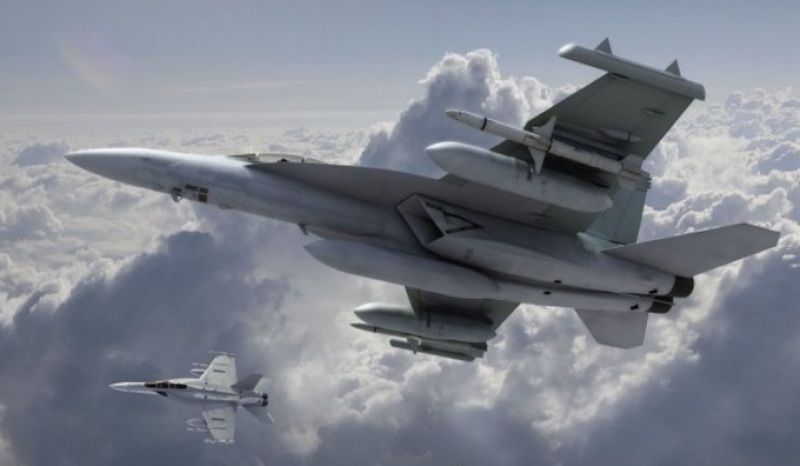 Chief of Air Force, Air Marshal Leo Davies confirmed the Royal Australian Air Force (RAAF) and US Navy signed the MoU to jointly develop the AN/ALQ-249 Next Generation Jammer Mid-band (NGJ-MB) capability. US Navy Program Executive Officer for Tactical Aircraft Programs, Rear Admiral Michael Moran; PMA-234 US Navy Program Manager Captain Michael Orr; and Air Vice-Marshal Cath Roberts attended the MoU signing held on 18 October at US Pacific Fleet Headquarters, Pearl Harbour, Hawaii. The MoU provides the framework for communication, co-ordination and co-operation between the US Navy and RAAF during the NGJ-MB engineering and manufacturing development phase. "This is a very important milestone for both nations, one that took four years of communication and collaboration to successfully achieve," AIRMSHL Davies said. "As this is a rapidly evolving area, we will work in partnership with the US Navy to develop the next generation jamming capability, which will ensure that our aircraft remain at the technological forefront throughout their service life." The Next Generation Jammer will improve RAAF capability and ensure RAAF EA-18G Growler aircraft can counter emerging threats. Currently, there are 12 EA-18G Growlers based at RAAF Base Amberley. Defence said this capability reduces risk to our forces and improves their situational awareness and provides a complementary capability to the F/A-18F Super Hornet and the future F-35A Lighting II aircraft.